Engineered to Photron’s usual very high standards (we enjoy the best reputation for reliability and user satisfaction in our industry) the FASTCAM SA2 utilizes a purpose-built electronically cooled 12-bit monochrome, 36-bit RGB color, sensor for excellent light sensitivity, color fidelity and dynamic range. If you’re fed up with the dull, muddy images from other high speed cameras provide, perhaps it is time you took a look at the SA2. 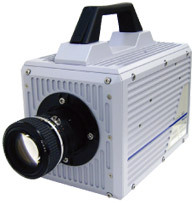 Operating as fast as 86,400 frames per second at reduced resolution, the SA2’s CMOS sensor is perfectly suited to provide our PIV and DIC customers with a new solution for their high speed imaging applications requiring greater resolution than our proven FASTCAM SA1 and 1024 PCI systems provide. The FASTCAM uses an RS-422, hot-pluggable, remote control keypad for easy operation without needing a computer connected at all times. The FASTCAM SA2 is available in three memory configurations; 8GB, 16GB, 32GB and 64GB providing affordable record durations to over five seconds at full HD resolution at 2,000 frames per second. To help ensure your images are crystal clear a 2.7 microsecond shutter is used, independent of frame rate, to remove any blur from subjects moving fast within the sequence.